The 11th annual Marco Manuscript Workshop on the theme of “Performing Texts” took place February 5-6, 2016. In the medieval and early modern period, reading was generally an auditory and often a social experience, unlike modern practices of silent and usually solitary reading. The manuscript is only the silent record of the voices and actions it inspired. Our eight speakers spent two days discussing how do we interpret and represent the manuscript record to recover the performance imbedded in the text. The workshop was organized by Marco professors Roy Liuzza (English) and Maura Lafferty (classics). The Marco Institute hosted its 13th annual Symposium March 3-4, 2016, 2016. The theme, “Rome: Beyond the Discourse of Renewal,” focused on new scholarly approaches to Rome, centering on how that city fostered innovation despite the traditional emphasis on revival. The symposium featured stimulating talks by 11 leading scholars from the United States, Canada, and England. Kate Cooper (University of Manchester) gave the keynote address, “City of Martyrs: Rome at the End of Antiquity.” Spanning late antiquity until the early modern era, the talks illustrated the city’s original developments that were not stifled by the strong legacy of the classical past. Setting aside the assumptions embedded in the concept of rebirth allowed the speakers to shed new light on the local polemics and cultural dynamics of medieval and Renaissance Rome. As a major center for Medieval and Renaissance Studies in North America, the Marco Institute frequently hosts large scholarly conferences. Most recently, we welcomed 240 faculty and graduate students from across the region for the annual meeting of the Southeastern Medieval Association (SEMA), which met in Knoxville from October 6-8. 2017. UT has a long connection with SEMA—the association was founded at UT in 1974, and the Medieval Studies Program (the predecessor and foundation of Marco) hosted its annual conference in 1999. This year’s attendees presented papers connected to the theme of “Place and Power,” commemorating the 950th anniversary of the Battle of Hastings (the deciding battle of the Norman conquest of England in 1066). The 74 panels focused on a broad range of topics: landscape, boundaries, sacred spaces, power, politics, appropriation, and struggle. 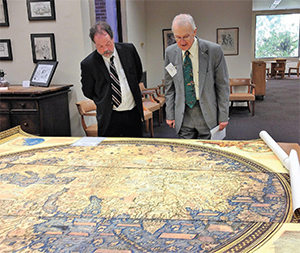 The conference offered an excursion to Special Collections at Hodges Library, as well as job market mentoring and roundtables on Alt-Ac careers and academic publishing. Participants also had the great pleasure of hearing from two distinguished plenary speakers: Professor Elizabeth Fowler (English, University of Virginia) and Professor Lawrence Nees (art history, University of Delaware). 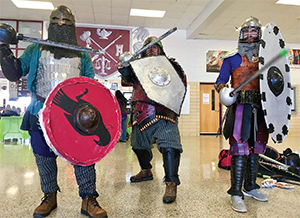 The second-annual Medieval Day took place on Saturday, January 28, 2017, at Bearden High School (BHS). This community outreach event sponsored by the Marco Institute began as “Marco Madness” in April 2016. The first iteration was open to students from BHS, and had an attendance of approximately 50-60 students. In 2017, we opened the event to all Knox County middle- and high-school students and teachers, and had an estimated attendance of 250-300! The event included talks by UT faculty and graduate students on topics including archaeology, the Black Death, medieval monsters, traveling to archives, medieval languages, and more. 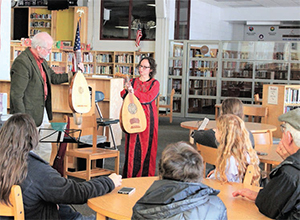 Students learned about the differences between the lute and the ud, and participated in catapult-shooting contests. 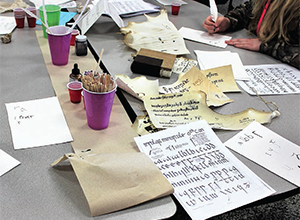 There were hands-on activities that allowed students to design mosaics and heraldry, try their hand at being medieval scribes by writing with quill pens on real parchment, and examine reproductions of medieval manuscripts. Members of the local chapter of the Society for Creative Anachronism put on fighting demonstrations and brought in samples of medieval craftwork and armor.